Feed wheel, feed rollers, replaceable rollers, or non-marking rollers, whatever you call them Centric Inc has a Western Roller Company urethane feed roller system that will work for you. These urethane feed roller systems are designed to fit, Diehl Accumould, Wadkin, SCM, Mattison 276, Weinig 140mm / 170mm moulders along with Mid-Oregon feed tables and most other powerfeeders. Urethane tires come with a 3 or 6 bolt on pattern and come in over 60 sizes ranging from ¾” to 6” width and 3 ¼” to 16” diameter to fit a wide range of machines and applications. Urethane feed rollers are a soft feed roller system for moulders, rip saws, band saws, feed tables or for any application in which a non-marking, high traction, soft feed roller system is required. Tires will enhance the quality of your wood products. Our high traction urethane tires provide more traction with less pressure, eliminating excessive feed roll pressure - the major cause of raised grain. Tires are non-marking, heavy duty rollers that enable you to feed scant stock, reruns, presurfaced or prefinished stock worry-free. Decrease your reject figures by using urethane rollers with less stock breakage and stoppages that cause burn marks. Tires are precision molded from high performance polyurethane. Our materials have been specially formulated for increased toughness, traction, abrasion, and heat resistance”. Hubs are fabricated using CNC technology. Standard hubs are flush sided for stacking and can be made custom by being bored and keyed to your specifications. Additional features such as set screws and special mounts are also available. Our hubs will provide you with many years of trouble-free service. P2000 roller system features seven core sizes plus special mounts. Additional features include 26 different diameter covers in 6 standard hardness options to compliment polyurethane rollers up to 12" long. 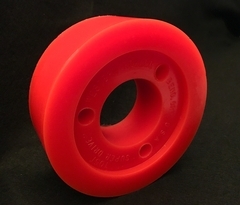 Urethane rollers can be cut to length to adapt to your special needs. Made custom by casting the bores, keyways and special mounts to your specifications, we can provide economic and engineering advantages over urethane rollers that would otherwise be machined or fabricated from steel or aluminum and then covered. P2000 roller system gives you the flexibility to create custom rollers from our standard tooling. Additionally, our dual durometer roller system features an economical one-way design that eliminates the need to return your rollers for recovering. Centric has in stock urethane feed rollers that come in three different hardness durometers. Durometer is one of several measures of the hardness of a material. Higher numbers indicate harder materials; lower numbers indicate softer materials. Centric offers 70 durometer, 85 durometer, and 95 durometer; with additional harnesses upon request. The 70 durometer rollers are yellow in color, 85’s are orange, and rollers of 95 durometer hardness are red. A 70 duro tire will provide the most grip with the shortest run life. The 70 duro tires are most appropriate in applications such as a in a powerfeeder. The 85 duro tire is by far the most common, at 85 durometers this orange tire provides a great balance between grip and run life. If you are unsure of what hardness you should be using we suggest you start with an orange 85 duro tire. The 95 duro tire is the hardest we offer in our stocked inventory. 95 durometers will give you the best possible run life with the least amount of grip; these are most applicable as hold down rollers.